In September, 1948 Al Capp (Lil' Abner comics), decided to solve the problems of mankind by inventing the Shmoo, who only did good. So out of the hidden valley of the Shmoon, somewhere in the Dogpatch country, poured millions of ham-shaped toeless shmoos. Wherever he went, Lil Abner presented free Shmoos to all comers, because a single Shmoo could produce an endless supply of the necessities of life at absolutely no cost to the Shmoo-keeper. The Shmoo is a little animal who lays eggs and gives milk, both Grade A, of course. The Shmoo himself, when fried tastes exactly like chicken and when broiled comes out like steak. A Shmoo's eyes make splendid suspender buttons, and his whiskers make the finest grade toothpicks. When you look at one as though you would like to eat it, it dies out of sheer will to please you. Al Capp used the Shmoo to show us that this big earth itself will give us everything we want, just as the Shmoo does, if only we leave it alone and not abuse all of the good. 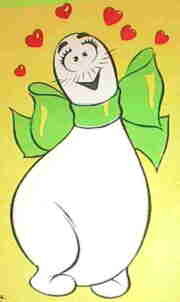 If only, in our passion and hatred and intolerance, we don't tear it apart, the Shmoo will live on forever! So love your little Shmoo and he will love you back.. and may he bring everything good to you always. Shmoo Items would be listed on CARTOONS page.